Let’s face it. Sometimes life gets a little hectic. Maybe you got stuck at the office and missed your workout, or maybe you are traveling and don’t have access to a great gym or running trail. Life happens. However, having a few workouts that will work absolutely anywhere and need no equipment will help you put your excuses aside and get your workout done (even if it means you have to workout in your hotel room or your garage). 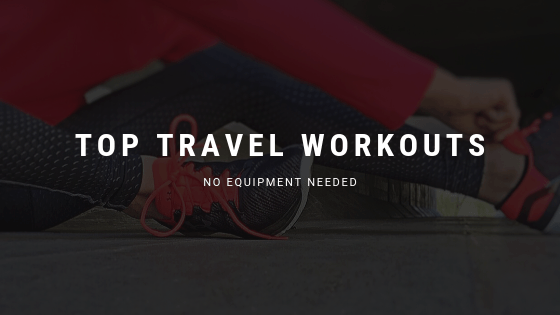 Today, we’ve got our top 3 travel workouts for you. We use these workouts when we don’t have much time, we are on vacation, or we just need to get a workout done while our kids play at the park. All of these workouts can be done with minimal space and just your body weight. The structures are solid, so you can use these even if you have a fully stocked gym at your disposal. Simply change up the exercises, include some weights, or add in a run. Next time you are busy, traveling, or didn’t make it to the gym, don’t allow your excuses to stop you from getting a workout in. Exercise has so many benefits. The great news is, it doesn’t take a full hour to reap those benefits. So, give yourself a few minutes and get one of these workouts done no matter where you are. For the FOF 10 —> 1, you will start with reps of 10 on each exercise. Work your way down the list, and then move to reps of 9. Once you finish 9, you will start on 8. Continue this pattern until you reach 1 rep of each exercise. I did a version of this workout in my garage with some equipment a few weeks ago, and it was a great workout. Here’s what I did. This workout is an old one but a great one. Over the years, we have done hundreds of variations of this exact workout. In fact, I did three different variations last year when we were on a cruise. I couldn’t handle the gym, so I simply used the outdoor track. Start with reps of 21. Count down by 2 reps each round. So, your reps equal 21, 19, 17, 15, 13, 11, 9, 7, 5, 3, and 1. You can start and end this workout with a 1 mile run if you have running space. If you have a weight, you can do my favorite version of Big 21. I absolutely love a good EMOM. EMOM simply stands for every minute on the minute. For this workout, you will start a new exercise every minute. The goal is to complete the exercise as fast as possible so that you can rest before the next minute begins. You will go through the list of exercises six times. Take a one minute break after each round if needed. With these three workouts, you have no excuse to let your workout slide just because you didn’t make it to the gym. Give yourself the gift of a few minutes to clear your head and challenge your body. I promise, you will be better and more productive if you give yourself the time to sweat. Do you struggle getting workouts done on your own? Come join us at one of our Fixed on Fitness boot camp classes. Fixed on Fitness is an incredible community that will encourage you, challenge you, and motivate you. You can try any of our classes for one week for free. Every workout is different, and each workout is led by a certified personal trainer that is there to guide you. Our trainers are experienced and ready to help you. Start your free week today.